I sponged on the yellow and green by painting a yellow dot on the sponge and painting the green around it. To get the best coverage I painted all the nails with 2 coats of the yellow before sponging. 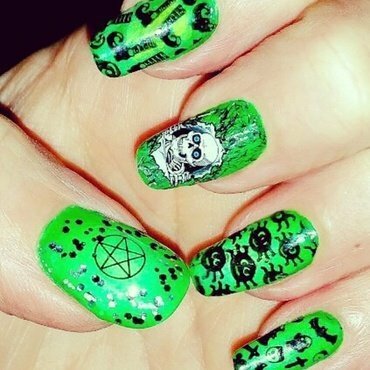 I then stamped on all the images but the skull and pentagram. Those are both nail water decals I got through AliExpress. I added a large chunk silver glitter around the pentagram on the thumbs. I topped with Seche Vite.